That’s right: I’m going to be an uncle again — and again — because my sister is pregnant with twins! Identical ones. You may recall how excited I was when my sister was pregnant with her first child. Well, double it. I knew I’d be an uncle again someday, but twins is just so cool. It’s two for the price of one. It’s two times as much fun. It’s twice as nice. And one day, when I’ve got my niece, Abby, and my two new nieces or nephews (I won’t know which for a couple weeks) chasing me all over the yard or crawling all over me or sleeping on me … well, that’ll just be the best. 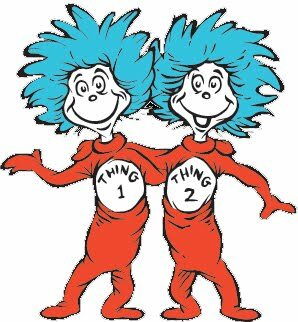 And it’ll also be fun to figure out which is which, or to dress them up as Thing 1 and Thing 2 or Tweedle Dee and Tweedle Dum, or to make all the obvious other twins jokes. Ha ha ha … I’m already laughing at the fun I’m going to have with these two. Holy cow. If you thought I was a doting uncle before, just wait until I’ve got three kids to spoil. It’s gonna be awesome. I’m so excited.